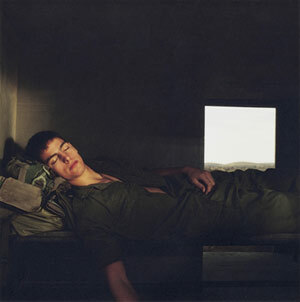 Using hired models, make-up, and teams of assistants, Israeli photographer Adi Nes (born 1966) creates meticulous, large-scale staged photographs depicting Israeli soldiers at work, in combat, at play, and at rest. Exploring themes of masculinity, fraternity, and national and cultural identity, Nes’s photographs contain an artifice that subtly questions gender identity in a specifically Israeli context — that of the army. At first glance his soldiers are seemingly tough and macho, however they soon reveal themselves to be tender - and posed. Nes re-interprets paintings from art history such as Leonardo’s The Last Supper (1498) , as well as photographs from Israel’s more recent political history. One picture, for example, depicts five soldiers on a flagpole, a re-staging of the famous photograph of the flag being raised in Um Rashrash (Eilat) during the War of Independence. In Nes’s version, however, there is no flag — its absence deprives the scene of its original meaning and impact. 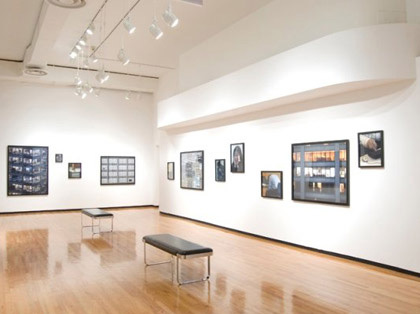 This exhibition is organized in partnership with the San Diego Museum of Contemporary Art, La Jolla.